Your FREE copy of Lost City of Gold is on its way to your inbox. Whoohoo! 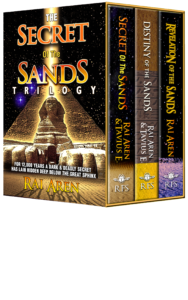 In the meantime, since you’re likely interested in archaeology adventure stories, I thought I’d let you know about a great deal – The Secret of the Sands Trilogy e-book box set is available now for one LOW price! If you love ancient mysteries, this is the series for you. The Secret of the Sands Trilogy is a story in the spirit of Indiana Jones & The Mummy! Just click on the link below to learn more. The box set is at a discounted price to the cost of the individual books! Click here to find the box set on Apple, Barnes & Noble, Indigo, Kobo and more!